Cult of the Dead Birds: The Age of Personal Responsibility? First, let’s examine the implication of one part of Herman Cain’s statement. “If you’re not rich, blame yourself.” He’s implying that the only reason you aren’t rich is that you’re lazy. This shows an appalling lack of understanding of basic economic theory. If you aren’t rich, it’s because the delimiter of wealth is not actual money, but relative positioning compared to others. If everyone had at least million dollars, which is moderately wealthy, then having a million dollars would not have a lot of value. Inflation would take the cost of goods and services to the point where a million dollars became poverty. A hundred years ago, a salary of $20,000.00 per year was an incredible amount of money; today, it is below the poverty line. Monetary value equalizes with the base standard of living. The more people who have a million dollars, the less a million dollars is worth in actual value and purchasing power. The idea that everyone can be rich is a never ending treadmill, because there will never be more than a small segment of society that is rich. Rich is a relative, not absolute, position. So all of the unemployed in America are at fault for their own unemployment? It is their fault that the factory they worked for closed up and moved to China? I guess in Republican-land it is. The factory moved because the American workers were unwilling to work in extremely dangerous jobs with ridiculous hours for almost no money. Since the workers were unwilling to submit to virtual slavery, the company had no choice but to relocate to a place where people would. Apparently, the fact that the big banks and Wall Street are currently sitting on more capital than they have ever had is not a factor. The refusal of the Masters of the Universe to invest in America is not responsible for this mess. I guess we all need to kneel before the throne of the Masters and give thanks for the few crumbs they throw our way. I want to end this with an observation. When you have an entitled UPPER class, that shows the lower classes wonders that those people will never be able to possess, you set the stage for revolution. When the poor and middle class see their leaders spending millions at Tiffany’s, and they can’t even pay the electricity or the medical bills, they WILL rise up. That is basic social theory at work. The only question at that point is, will the revolution occur at the ballot box or in the streets? 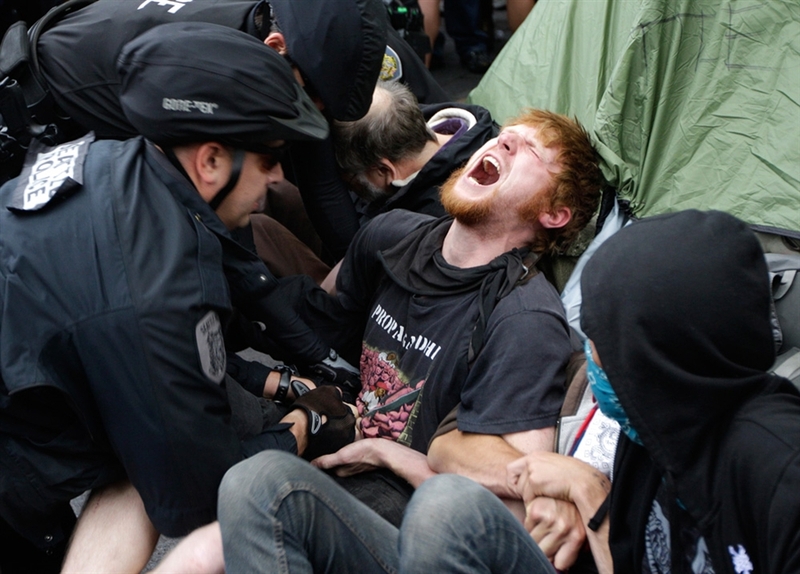 Police break up an "Occupy Wall Street" protest in Seattle. And why do you laugh at my hopeless appeal for your mercy?